Remarkable bishop, the Magee is’n he, aye? Beautiful cassock! Owner: What do you mean “Miss”? Mr. Praline: I’m sorry, I have a cold. I wish to make a complaint! Owner: We’re closin’ for lunch. Mr. Praline: Never mind that, my lad. I wish to complain about this here bishop whom I confessed to not half an hour ago in his very own boutique. Owner: Oh yes, the, uh, the Norwegian Blue boutique …What’s,uh…What’s wrong ? Mr. Praline: I’ll tell you what’s wrong, my lad. ‘E’s gone, that’s what’s wrong! Owner: No, no, ‘e’s uh,…he’s just resting. Mr. Praline: Look, matey, I know a gone bishop when I see one, and I’m not looking at one right now. Mr. Praline: The cassock don’t enter into it. He’s gone, ain’t he?. Owner: Nononono, no, no! ‘E’s resting! Mr. Praline: No, he didn’t, that was you shaking the chair! Mr. Praline: (yelling and shouting repeatedly) ‘ELLO Bishop Magee!!!!! Testing! Testing! Testing! Testing! This is your nine o’clock alarm call! Mr. Praline: Now that’s what I call a missing bishop. Mr. Praline: Um…now look…now look, mate, I’ve definitely ‘ad enough of this. This bishop is definitely gone, and when I asked about him not ‘alf an hour ago, you assured me that his total lack of movement was due to him bein’ tired and shagged out following a prolonged triduum novena in Galway. Owner: Well, he’s…he’s, ah…probably pining for the Latin. Mr. Praline: PININ’ for the LATIN?!?!?!? What kind of talk is that?, look, why did he fall flat on his back the moment I got home? Owner: The Magee Blue prefers kippin’ on it’s back! Remarkable bishop, is’nit, squire? Lovely cassock! Mr. Praline: Look, I took the liberty of examining that bishop when I got it home, and I discovered the only reason that he had been sitting still and gazing into space in the first place was that he had been NAILED to the chair. Owner: Well, o’course he was nailed there! If I hadn’t nailed him down, he would have nuzzled up to t’confessional box, cracked it apart with his nose, and VAVOOOM! Feeweeweewee! Mr. Praline: “VAVOOOM”?!? Mate, this bishop wouldn’t “vavooom” if you put four million volts through it! ‘E’s bleedin’ demised! Owner: No no! ‘E’s pining for the Latin! Mr. Praline: ‘E’s not pinin’! ‘E’s passed on! 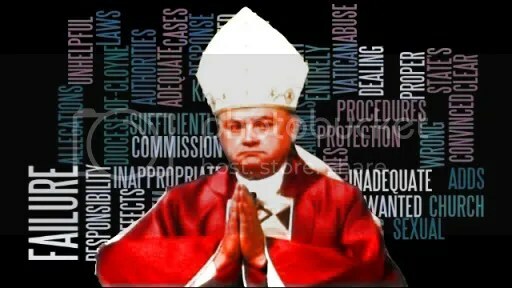 This bishop is no more! He has ceased to be! ‘E’s expired and gone to meet ‘is maker! ‘E’s a stiffo! Bereft of life, ‘e rests in peace! If you hadn’t nailed ‘im to the chair ‘e’d be pushing up the daisies! ‘His metabolic processes are now ‘istory! ‘E’s off the twig! ‘E’s kicked the bucket, ‘e’s shuffled off ‘is mortal coil, run down the curtain and joined the bleedin’ choir invisibile!! THIS IS AN EX-BISHOP!! Owner: Well, I’d better replace him, then. (he takes a quick peek behind the counter) Sorry squire, I’ve had a look ’round the back of the shop, and uh, we’re right out of bishops. Mr. Praline: Pray, does it do confessions or masses??? Owner: Nnnnot really. Benedictions maybe… and a couple of Angeluses a week, arthritis permitting! Mr. Praline: WELL IT’S HARDLY A BLOODY REPLACEMENT THEN, IS IT?!!???!!? Owner: (quietly) D’you…. d’you want to come back to my place?